Sieve the flours into a mixing bowl. Stir in the ghee and lemon juice. Stirring, add a little coldwater until the mixture is the consistency of a thick cream. Stir in the chilli, spices and herbs. Stir in the onions until well covered. Heat vegetable oil in a deep fat fryer or wok (fill 2/3). Wet hands and shape tablespoon sized amounts of mixture into balls. Place each one onto the baking tray. 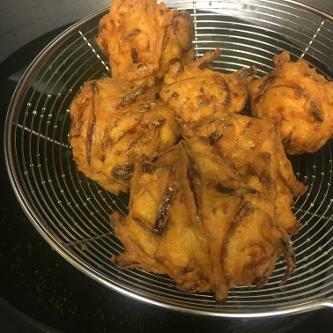 When the oil has reached 180 degrees, drop half the bhaji's into the oil. Stir carefully to stop them sticking together and turn occasionally for an even cook. Remove from the oil and pat with kitchen paper to remove excess oil.